PRIMUS has come up with a new type of gloves called STERILE GYNECOLOGICAL GLOVES of gynecological and obstetric use. 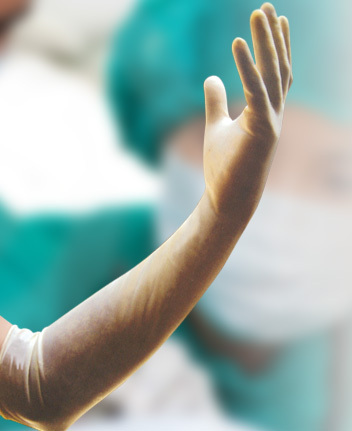 These gloves are made from natural rubber latex and is longer than the normal surgical gloves. These gloves gives an excellent barrier protection due to its extra length preventing cross contamination. This glove comes in two lengths - 14 Inches(350 mm) & 16 Inches(400 mm) Anatomic in shape , Powdered and Powder FREE. Polymer coated version of this product is also available. In medical industry these gloves are used in various processes like Gynecology / Obstetric ,Oncology Labs, Old age homes etc and in the pharmaceutical industry, these are used while handling formulations, tablets etc. The gloves are sterilized either by EO (Ethylene Oxide Gas) or by Gamma Radiation as per customer requirement. Packaging is based on specifications requested by the customer. NON Sterile version of this product, packed in dispenser boxes is also available . Sterile 16 inch: 15 x 30 cms Peel Down to Open Pouches 50 pairs/ dispenser.